When you are working on 24 GHz the beam angle of the dish is always very small and it is sometimes very difficult to aim the dish in the right direction. By using a combination feed for 10 and 24 GHz it is possible to allign the dish first on 10 GHz. The error on 24 GHz allignment will be very small and most probably within the 24 GHz beamwidth.The principle is to use a Cassegrain feed for 10 GHz with a special subreflector. The subreflector will reflect the 10 GHz signal to the dish. On 24 GHz the principle is to illuminate the dish as a prime focus feed. The subreflector is in front of the 24 GHz prime focus feed but due to the special designed patern of holes in the subreflector the 24 GHz signal will pass the subreflector with almost no extra loss. Principle of the combined 10 and 24 GHz feeder. The 10 GHz signal is reflected to the dish and works like a Cassegrain system. The 24 GHz signal passes the subreflector with very little loss and illuminates the dish as a prime focus feed. The subreflector is made of 2 mm aluminum with an accurate drilled pattern in it. The pattern is made by drilling holes of 6.5 mm with exact distances between the holes. Using a subreflector of 1/5 times the diameter of the dish gives a subreflector diameter of 16 cm with a 80 cm dish. This means that in the subreflector about 800 holes must be drilled with most accurate precision. 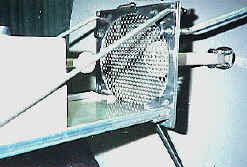 The subreflector can be mounted in front of the dish but must be alligned very carefully. After the allignment of the total system the gain on 24 GHz is almost the same as a prime focus feed. This is a picture from the multiband 10/24 GHz feeder made by Jan PAoJGF. The RF signal is an electromagnetic wavefront travelling trough space. The wavefront consists of an H component and a E component. 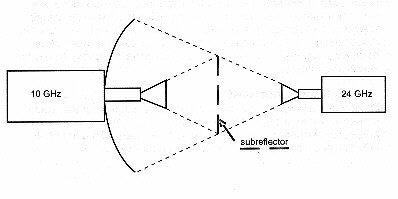 Each of the holes of the subreflector act as a round piece of waveguide. 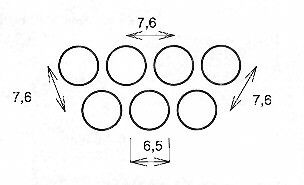 The diameter of the hole must be designed to act as waveguide for 24 GHz but as reflector on 10 GHz. For 10 GHz the hole diameter will behave as a waveguide below its cutt-off frequency. Therefore it will reflect the 10 GHz signal. The cutt-off frequency of this subreflector is arround 13.5 GHz. For 24 GHz the total radiation pattern after passing the subreflector is formed by summing the energy of each individual hole. When the subreflector is good positioned in front of the 24 GHz feed it will not cause extra losses. In this way an ideal multiband feed for 10 and 24 GHz can be realised. The mechanical constraints however can be quite high and will demand very accurate work. Practical results of this design give a performance very close to theoretical maximum values.